Both the universe and ourselves are regulated by universal principles. Through understanding these we can move away from the continual pursuit of change and dissolve the barriers that prevent transformation. We can find the inner poise, expand our consciousness and stop being at the mercy of circumstances and fate. Five of these principles are located within the domain of space/time/matter and can be summed up as: gender, causation, correspondence, rhythm and polarity. There are a further four outside the physical universe that can be described as: vibration, creative impulse, insight and communication. 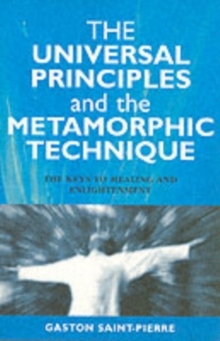 Gaston Saint-Pierre has developed the metamorphic technique, an approach to creativity, healing, self-healing, growth and transformation that draws widely on Hinduism, Buddhism, Islam, Christianity and Western esoteric literature. It is based on the fact that many of our life patterns, including illnesses and behaviour, appear to be implanted into our consciousness at the moment of conception. Understanding these principles allows us to reform our lives. Practically, it involves touching specific areas of the feet, hands and head, allowing innate intelligence to guide life forces towards release of patterns and difficulties, ensuring the release of our potential.